Caramelized Cornish Hen - Kosher In The Kitch! Caramelized Cornish Hen - Kosher In The Kitch! 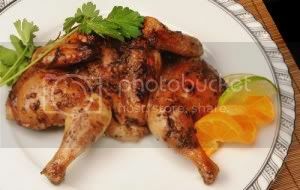 Place all Cornish hen pieces in a roaster that is sprayed with Pam. Mix all sauce ingredients and pour over Cornish hens. Roast uncovered for 50 minutes- 1 hour 350- 375 degrees till golden brown and caramelized. Sprinkle chopped parsley on top and serve with a fruited rice on the side. You can also use chicken cut in eight pieces for this recipe.